One musician, no matter how brilliant, doesn’t make an orchestra. And one musician, no matter how brilliant, doesn’t break an orchestra through their absence. But if more and more parts are missing, it ceases to be an orchestra. It isn’t what it’s meant to be any more. 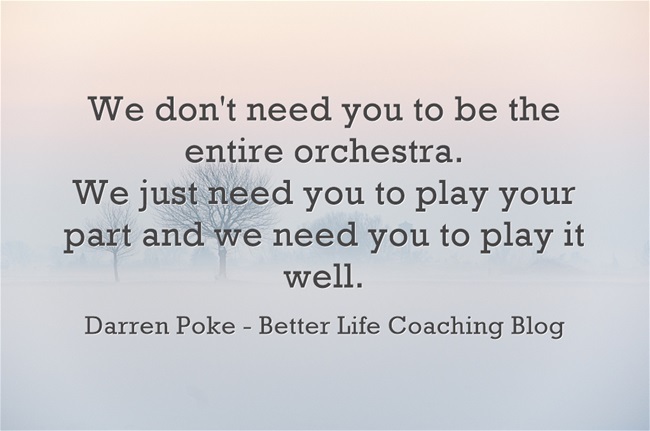 We don’t need you to be the entire orchestra. And no one should try to be something that they are not. You have certain skills, passions and perspectives, that if used properly can make a positive difference in the world. We just need you to play your part and we need you to play it well. Just imagine if we all did that. Previous post – Should You Stand Out From the Crowd? « Should You Stand Out From the Crowd?